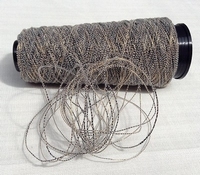 Horsehair from Mongolian origin, spun into a thread and reinforced with Egyptian cotton. This iw again one of those forgotten threads. Traditionally used a lot in virtually all-day practical life. And off surely for structural relief elements in needle lace and a lot of bobbin lace. The bobbin lace was used a lot for decorating straw-hats in the 18th and 19th century. We will warn you that it is a very difficult thread. You need to adjust your way of pulling and manoeuvring your bobbins or needle. The know-how is to use a lot of help pins. Make sure that if you make a few movements, that the knot is directly there were you want it. Afterwards no correcting anymore possible. Plus use as thick as possible bobbins. The bigger the diameter it is rolled up, the easier it will go to use. A suggestion: instead of using copper, steel or other wire for making rose petals, use a bit of this yarn for the outer contour. It will not rust or oxidise, horses do not oxidise, not even when they are standing in a wet feeld. Only rheumatism.